For me an epiphany is one of the wonders of the world that touches ones heart and spirit, affects us physically, psychologically and emotionally. Yet I believe that this experience is not only felt by us humans but is a universal phenomenon, a celebration of life itself. Therefore I have entitled my artwork, Helianthus annus, (Sunflower). Sunflowers have a type of phototropic response called heliotropism (sun turning). The leaves and heads of young sunflowers follow the sun and so to my mind they experience a daily epiphany as their heads turn each morning to the sunrise. This piece is a mixed media triptych 35cm X 22cm and is constructed from recycled barrel struts, my handmade paper from sunflowers grown in my garden and pressed leaves and petals, collage and paint. 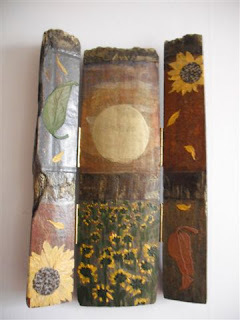 All my artwork is predominately made from recycled/found materials, apart from paint and hanging materials. My work has been widely exhibited in Edinburgh, East Lothian, North East Scotland, Dundee and Rome. Unfortunately I have not yet got round to organising a website! Coincidentally, International Sunflower Guerrilla Gardening Day is 1st May when guerrilla gardeners around the world plant sunflowers in neglected public places and bare roadside verges in their neighbourhood. The day the exhibition opens! Your triptych looks absolutely beautiful Mary. I would love to see the original artwork. Do keep us posted re your next exhibition.